This portrait is of Ignatius A. Few, a Methodist preacher and the commissioner of the construction of the Dahlonega Mint. He received much criticism for his lack of aggressive oversight during the construction process. He is probably best known today as the founder of what became Emory University. Source: Smith, Rev. 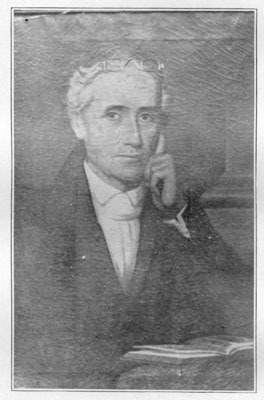 George G. The History of Georgia Methodism from 1786 to 1866. Atlanta, GA: A. B. Caldwell, Publisher, 1913, unnumbered page following page 82.